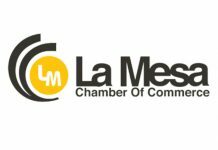 Middle East Chamber of Commerce recognized local businesses its 2017 Award for Excellence for impact within the community. 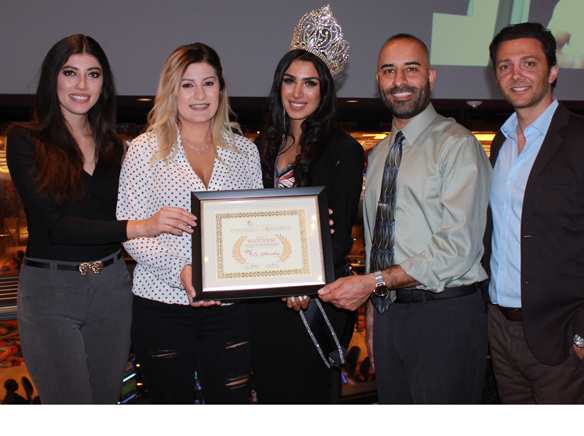 The friendly business mixer and awards ceremony was held at the Hollywood Casino in Jamul on Aug. 10 in the upstairs Loft 94 sports bar. The bar abuts an open-air patio with a panoramic view of the surrounding hills, and offers a variety of beers and whiskeys, small-plate menu options and choice cigars. Middle East Chamber of Commerce recognized local businesses its 2017 Award for Excellence for impact within the community. 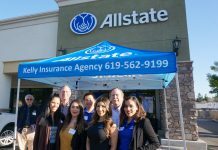 The friendly business mixer and awards ceremony was held at the Hollywood Casino in Jamul on Aug. 10 in the upstairs Loft 94 sports bar. The bar abuts an open-air patio with a panoramic view of the surrounding hills, and offers a variety of beers and whiskeys, small-plate menu options and choice cigars. As the official ceremony approached, other light menu fare was available for attendees at a corner serving station, including pickled vegetables, salad, hummus, falafel, Tabbouli, sliced beef and baklava. The evening kicked off with a social hour, featuring light appetizers such as kabobs and stuffed grape leaves, delivered on trays by circulating wait staffers. The event brought together more than 40 chamber members, award recipients and guests. El Cajon Councilman Ben Kalasho founder and president of the Middle East Chamber of Commerce opened the awards portion of the evening’s events, with brief welcoming remarks and a good-humored reminder that participants should check their pockets for extra money to play downstairs at the casino machines and gaming stations. “We are honored to know you and to be your friends,” Kalasho said. “Thank you for coming.” Then, Kalasho turned the podium over to his wife, Jessica Kalasho, Chamber CEO, for announcement and presentation of the awards. On hand to congratulate awards recipients was Miss Middle East USA 2017 Parand Biranvand. “This is a wonderful event. Everyone here has been great,” she said. The first announced award was in recognition of the Hollywood Casino. Samuel Tillman, director of player development, represented the casino in accepting the award. The casino has employed Tillman for 16 months. Hollywood Casino opened in October 2016. Second announced award from the Middle East Chamber of Commerce went to this publication, The East County Californian. Albert Fulcher, the newspaper’s editor, accepted the award. Fulcher said that is an honor when recognized by members of the community and he believes it gives validity to the hard working writers that provide diverse content for the paper every week. Other winners were spas, educational institutions, and businesses demonstrating practices that are notable for environmental responsibility and charitable community service. 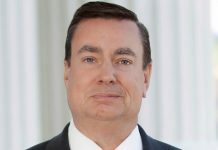 Well-known companies receiving awards ranged from Greenwood Memorial to Waste Management and Republic Services, Cox Communications, Toyota of El Cajon, and Sheraton San Diego. Helix Water District was recognized for delivering high quality water and superior service to East County residents. “My favorite part of these events is the networking, the opportunity for building a one-to-one connection as businesses,” she said. She singled out award honoree Advanced Training of El Cajon for special acknowledgement. The educational facility has belonged to the Middle East Chamber of Commerce for five years. “We are grateful at what they have done in providing effective training that focuses on preparing students for meaningful careers. The career college offers training programs in medical assistance, information systems technology and criminal justice,” she said. Previous articleSullivan Solar Power installs first certified LG Chem battery in the continental U.S.